Which now the angels sing.. 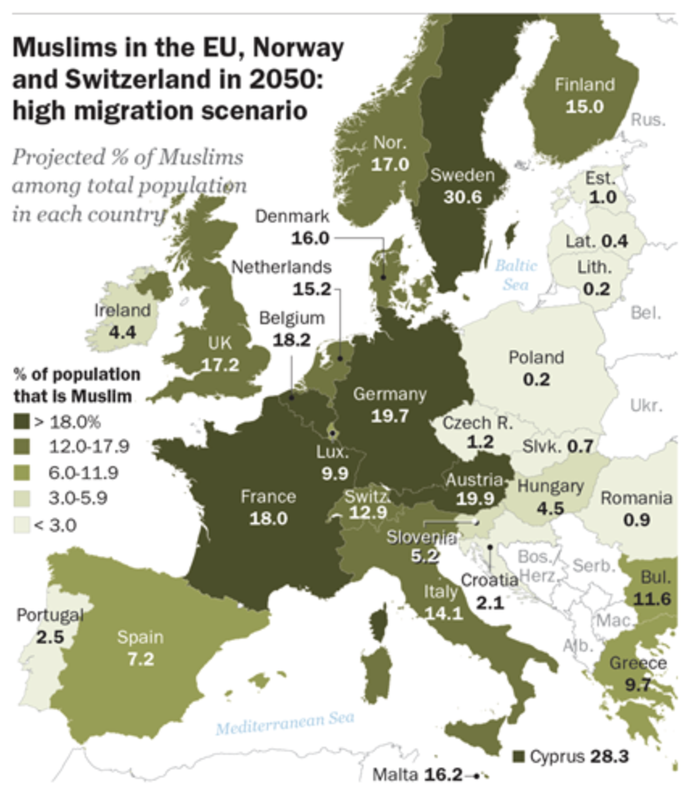 The latest report on Europe from the Pew Research Center takes a fascinating look at scenarios for Muslim population numbers in Europe in 2050. Their distinction between migrants and refugees - and the different profiles and patterns that go with it - is a valuable addition to the migration debate. I've blogged about Pew's religious research and forecasts before, and generally I find their analyses to be both reasonable and fair. What makes their most recent report interesting is that it includes forecasts for Ireland. 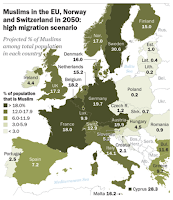 Under different scenarios for Muslim migration into Europe they show Ireland's Muslim population rising from 70,000 in 2016 to 200,000 in 2050 in the highest migration scenario. Though of course not all the growth will be from migration (Irish Muslims will add to population growth themselves), and not all migrants to Europe will be Muslim. And the overall population will grow too, hence the relatively low share of Muslims in the Irish population (4.4% in 2050) even in the high migration scenario. Pew's starting point is actually a little high. The 2016 Census report on religion showed that there were in fact 62,000 Muslims in Ireland. Though over a 34 year horizon it probably wouldn't make that much difference. The census doesn't differentiate between different Muslim traditions (Sunni, Shia, Sufi etc), though most likely the vast majority of Muslims in Ireland are Sunni (as they make up approximately 85% of the global Muslim population). The census does however distinguish Muslims in Ireland by nationality: it turns out more than half of Muslims in Ireland are Irish nationals. Half of the rest are defined as 'Other Asian', which is most likely Pakistan (for historic, cultural and family reasons). One of the biggest cultural (and family) connections is via the UK. Indeed, a recent BBC report highlighted the fact that over 40% of mosques in the UK are run by a specific traditional group from Pakistan called The Deobandis. I can only presume a similar presence in Ireland. Which makes for another scenario not considered by Pew: one involving Brexit. 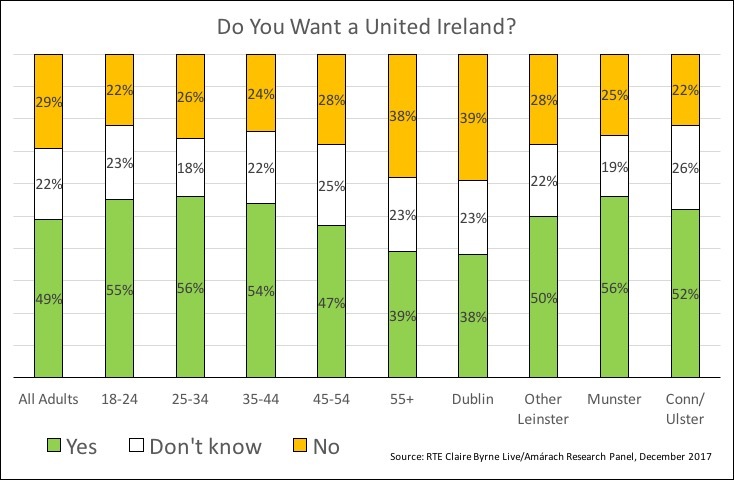 In the event of a hard Brexit I wouldn't be surprised if a large number of Muslim migrants to the UK - and a much larger number of non-Muslim migrants - will look to Ireland as a better location for business, cultural and family reasons. But perhaps the more interesting speculation is the impact on European culture, values and polities from some of the scenarios painted by Pew. Ireland - like central and Eastern Europe - will be relatively unaffected by Muslim migration (and refugees) in any of the scenarios. But France, Germany, Sweden and so on will undergo a much stronger impact. It doesn't have to lead to the type of seismic shifts envisaged by Michel Houellebecq, but it undoubtedly will lead to significant changes in the prevailing zeitgeist in Western Europe in particular. As Nassim Taleb reminds us, it is 'intolerant' minorities (i.e. : those with 'stronger' values than the wider population) who get to shape the wider cultural milieu for the total population. One reason, he explains, why Coca-Cola is kosher (and therefore acceptable to Jews, Christians and Muslims). But remember, scenarios are not forecasts: they are stories about what might come to pass, and therefore an invitation to ask ourselves how might we fare and respond in just such scenarios. I suspect we'll see a great many more such stories about the future in the years and decades to come.